My first trail run was a smashing success! That is to say, I did not do a major faceplant or break a leg - WIN. There were definitely some close calls, but this was a great race/course to try out this whole trail running bizness. One of the many great things about this race is that it started rather late compared to most road races. I'm guessing this is because there's no need for closures, etc. So I was able to sleep past 7am, and was so glad to get that rest. I chose the shortest (5 mile) distance, which started at 9:45. 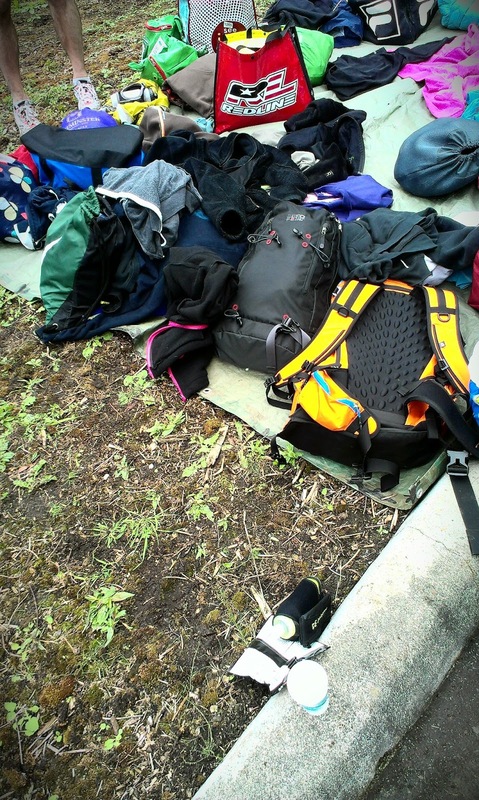 There were also 26.2, 50K and 10 mile options, which also seems to be common with many trail races, and the two longest distances started about an hour earlier. After downing my breakfast (oatmeal nuked with a frozen banana and a dollop of maple almond butter - this stuff is crazy good), I gave the kids about 20 hugs and kisses goodbye and headed out the door. The trailhead is situated amongst the many (beautiful) residential areas on the Sammamish Plateau. Since the parking lot is small, most participants had to park on the main road leading up to the trail. This was not a problem at all, as I was obviously one of the last to arrive (with my late start time), and it was no more than a quarter of a mile or so walk to the start. Walking along, I noticed that almost every single car had an oval sticker: 13.1, 26.2, definitely lots of 70.3's, and 50Ks. I was starting to wonder if I was going to come in DEAD LAST. Picking up my bib was easy and there was a big tarp set out for people to put their bags on; I wasn't sure if there would be somewhere for gear and was pleasantly surprised by this little setup of mutual runner trust. There were about six port-a-pottys and the line moved fast. I listened to the 10 mile pre-race announcements, used the facilities one last time and before I knew it, they were doing the 5 mile pre-race announcements and raffle (pretty cool that they did a raffle for each race distance). I loved that things were small enough that we could all gather 'round and easily hear the race director talk about the course through his bullhorn. It's pretty cool how they set up the spray paint on the ground and flags so that you know where you're going, when to turn, that you're on the correct path, etc. All the course markings are on the side of the trail that you'll turn next - flags on the right side of the trail before a right hand turn and vice versa. I quickly learned that the less I had to think, the better. The first mile was on a fire road that would have been pretty easy to cruise along, except for the fact that it's been pretty rainy lately and there were some big sections of shoe sucking mud that were hard to navigate. At least there was a nice big and dry downhill portion before we hit the single track trail that comprised most of the 5 mile course. Once on the trail, I just kept my head down and followed a few women that seemed about my pace. I'm sure I was making lots of huffing and puffing sounds and, at one point, the person in front of me said to go ahead and pass. I told her it was all I could do to move forward without falling on my face. Although, after another half mile or so, I was kind of getting into the swing of things and told her I was gonna go for it and went ahead and eked past her on a spot that wasn't too narrow. I seriously felt like I was FLYING, leaping over tree roots, side stepping rocks, going over all the undulating ground. In reality, I was doing ten minute miles, tops. I think this probably has something to do with being so close to all of the trees and my brain's perception that I was passing them all so quickly, when normally I don't perceive myself passing anything but the occasional runner during a road race. It made the time go by pretty quickly, all that concentrating on my feet and the trail. Although, I must admit, it also started to make me feel a little queasy. All of the ups, downs, and hairpin turns were giving me a slight case of motion sickness. After awhile I just started thinking about concentrating on my breathing and footsteps while inhaling that beautiful, sweet trail air. I did have my headphones in, but I didn't put on my music; I just wanted to hear my splits from my GPS app and not broadcast them throughout the woods. Before I knew it, the loop on the trail was over and we were on the fire road going back the way we came - which meant having to go back up that nice downhill from the beginning. That's where I really slowed down, because I still haven't come to terms with the negative talk that goes on in my head during hills. It was about 100 ft of elevation over .5 miles - not terrible, but my legs were feeling like rubber after the new crazy workout they'd just been through. 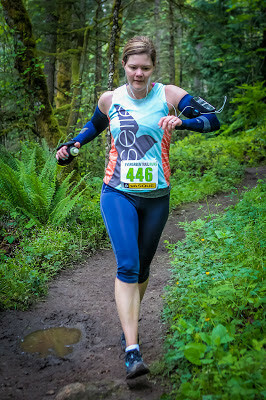 Other than slowing to a brisk walk a few times along that hill, I was really happy with how I did for my first experience running on trails: five miles in 54:15 and smack dab in the middle of the pack for the race as a whole and for my age group (not dead last). I've run an Evergreen Trail Run event before, and love that they are small and have a homespun feel. 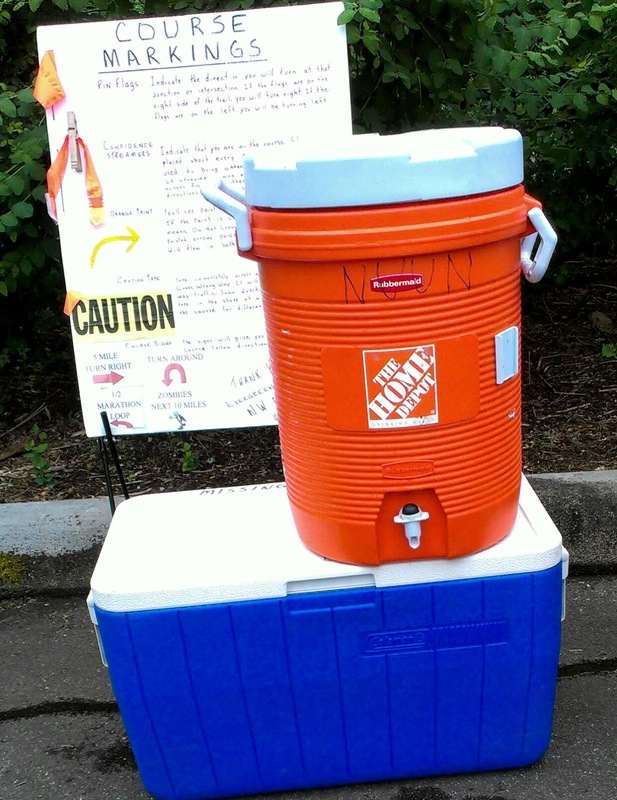 I ran the Lake Sammamish Half last year and, even though it's their larger race with about two thousand folks, they still had big bowls of chips, bananas, Oreos, candy and other fun goodies. The same was true for Soaring Eagle. I love having easy access to post race food, and so much of it! I chowed down on a Costco muffin half (yes, they had a bowl full of them cut in half), grabbed some Muscle Milk and Food Should Taste Good samples for the road. Major bonus? 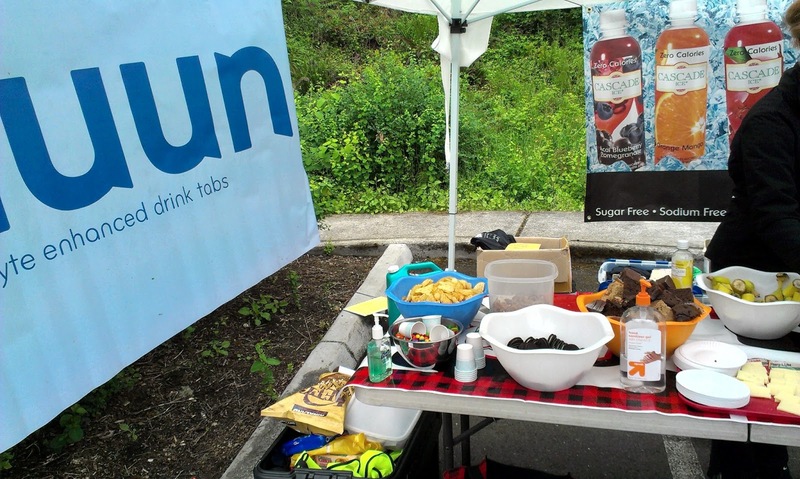 Nuun is a sponsor for Evergreen Trail races. To top it all off, they have an amazing photographer who (quickly) uploaded gorgeous pictures at such great prices. That is a great picture! Great job on the trail race! Sounds like more trails for you in the future? Very nice, Andrea! 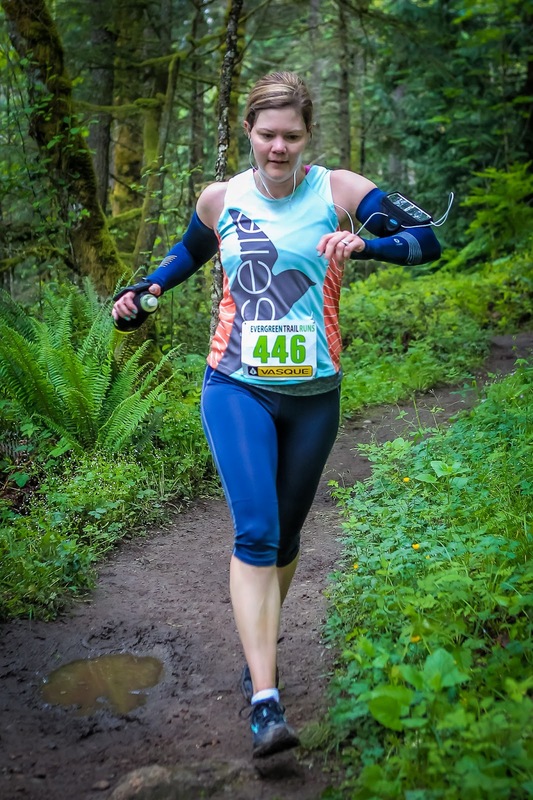 Congrats on the trail run & so fortunate for you to have an awesome photo to remember it by! Doing one of these is definitely on my punch list. Very cool, makes me kind of want to do a trail race now :). And that is an AWESOME picture of you and even more awesome that the price isn't ridiculous!